Baby booties, or baby shoes, can define an entire outfit for your little one. Inspired by the magic of rainbows, the fantasy of fairy tales, and the whimsy of childhood I have expertly crafted these baby booties. These delightful shoes add a touch of the rainbow to any ensemble and will transform even the gloomiest of moods into bright smiles and giggles. Each pair of these colorful booties are made using a crocodile stitch technique, variegated wool/nylon blended yarn, and rainbow buttons. Colours of the rainbow. Each pair of these baby booties will stretch slightly, allowing your little one to grow with the shoe hence the range of the measurements above. Your rainbow shoes are easy to care for and can even be washed in an automated washer in cool water on the gentle cycle. I recommend using mild detergent and a mesh lingerie bag (or pillow case). You may hand wash your booties, alternatively, and they should always be laid flat to air dry. Your pair of colorful baby shoes will be made in my smoke free studio and shipped to you in a waterproof satchel. 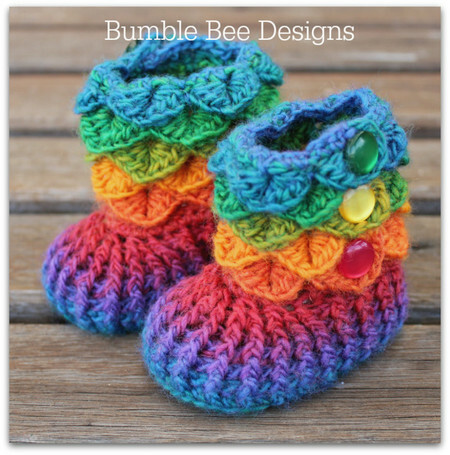 As with all handmade products, no two pairs will be exactly alike and there will be natural variations in the color, texture, and placement of your rainbow shoes when compared to the pictures above. Please contact within 3 days of purchase and pay within 5 days. Australian buyers I'm happy to accept bank deposit please leave your ebay user id or item number as reference.